Leea aculeata var. moluccana Miq. Shrub or small tree reaching a height of 11 meters and 18 cm dbh. Stems are spiny. Stipules ca. 25 mm long, a narrow wing. Leaves are smooth and trifoliate or pinnate compound. Leaflets are oblong to subelliptic, up to 15 centimeters in length or more, 3 to 4 centimeters in width, the terminal leaflet being larger, prominently toothed along all margins except the base, pointed at the tip, blunt at the base. Flowers are white-yellow-pink, and borne on corymbs 5 to 8 centimeters long. Fruit is red, somewhat rounded, about 1.3 centimeter in diameter, red-blue-purple drupes. Usually in secondary regrowth and disturbed sites in mixed dipterocarp and swamp forests up to 700 m altitude. On alluvial sites, along rivers and streams and on hillsides, with sandy to clay soils, also on limestone. 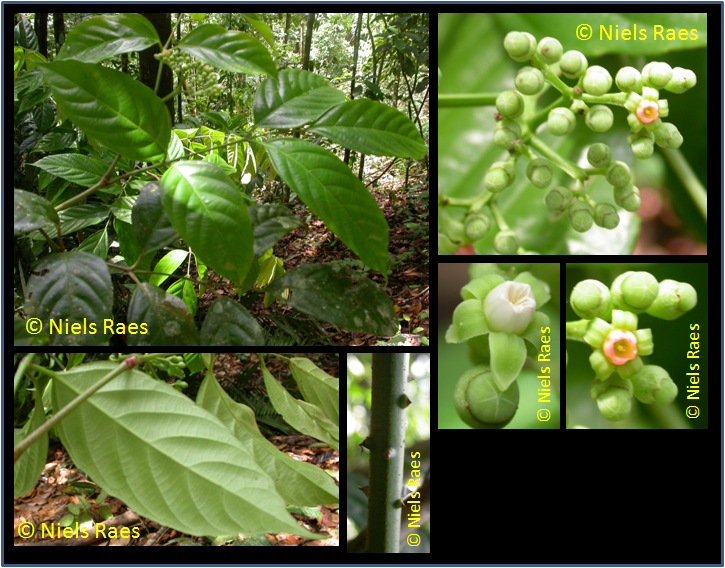 Leaves are reported to be used for purifying the blood (Philippines). Sumatra, Java, Borneo (throughout the island), Philippines, Celebes, Moluccas, New Guinea. Borneo: Bundong, Denigirut, Kenyupiang, Kruang, Mali-mali, Mali-mali beduri, Mali-mali bini, Njebo. Philippines: Mali-mali.